Today I’m going to try something a bit different. I’m going to let you know about three books. I noticed a few dog books on the shelves at Elizabeth Campbell Books are about specific dog breeds. Apparently, a lot of people are concerned about the individual needs of ‘purebred’ dogs. Somehow they believe that ‘purebred’ dogs are somehow different from other dogs of ‘mixed parentage’, like the mighty Great Newfenees, and need special care and training as a result. A hundred two-legger years from now, you will begin to realise that type of breed segregation is wrong-thinking. Sometimes it takes you a while, but generally speaking, you two-leggers eventually wake up to wrong-thinking and do your best to change for the better. Look at the way the folks at It’s a Dog’s Life are helping underprivileged dogs now. Most of them are mixed breed. Coincidence? I hardly think so…. Read all about it: Newfoundlands are a mixed breed! I understand a bit more about ‘purebreds’ now that Elizabeth and I have had a little talk on the subject. I think it’s a silly way to look at dogs, though, just the same. Think about it. All these ‘purebred’ dogs are just dogs that have been -er- introduced to one another because they have certain talents that their two-leggers have wanted to use. If you look far enough back into, say, my Newfie grandparent’s history, you’ll discover that the original Newfoundland Dog was … yep. A mixed breed dog (Wolf, Northern Spitz type, Tibetan Mastiff, Great Pyrenees, and a host of others. Newfs are true mutts!). Like me. And if you don’t believe me, it says so in one of today’s selections: The Newfoundland. Noble profile, yes, but he’s really just a rabbit-chaser at heart. Spaniels come in many different sizes, so probably there has been some mixture there two, although that’s just my own dog-sense kicking into play. 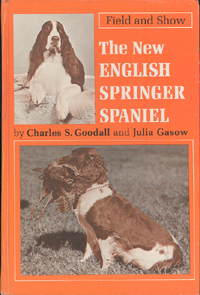 The origins of the Springer Spaniel are somewhat obscure, but probably Spanish, or so says Elizabeth’s book on the breed. 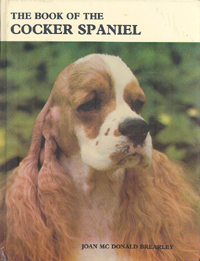 Her book on Cocker Spaniels mentions that those Spaniels probably originated in Carthage, and that they became highly prized when Carthaginians went to Spain and found lots of rabbits there in 238. Carthaginians called rabbits ‘span’. Spain means Rabbitland. Hmm… sounds like a fun place to live! Even more fun for Spaniels, a.k.a. Rabbit Dogs to the Carthaginians. The author goes on and on about dogs and rabbits in her introduction, and if you want to learn more, you can buy the book. If you buy any of these books this week, remember, Elizabeth will give 20% – my commission – to It’s a Dog’s Life in Kenora, who look after rabbitless and two-leggerless pooches until at least two-leggers can be found to love them.